Cinemark The Grinch Christmas Sweepstakes – Win a $1,000 Visa gift card! Win a $1,000 Visa gift card! ENTER SWEEPSTAKES HERE – Cinemark Sweepstakes page. ENTRY LIMIT – Limit: You may enter one (1) time during the Promotion Period, regardless of method of entry. ELIGIBILITY – The Grinch Christmas Sweepstakes is open only to legal residents of the fifty (50) United States and the District of Columbia who are at least eighteen (18) years old at the time of entry. SWEEPSTAKES ENTRY PERIOD – The Sweepstakes begins on October 9, 2018 at 12:00 a.m. Eastern Time (“ET”) and ends on December 26, 2018 at 11:59 p.m. ET. 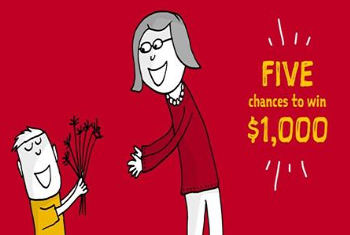 PRIZES – ONE (1) GRAND PRIZE: $1,000 Visa® Prepaid Card. Approximate Retail Value (“ARV”): $1,000. WINNER’S LIST – For a winner list, visit http://bit.ly/2NQ0k5u. The winner list will be posted after winner confirmation is complete. 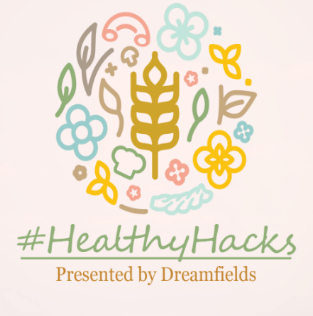 Dreamfields’ #HealthyHacks 2018 “Welcome Wellness Inside and Out” Sweepstakes – Win a $1,000 Visa gift card & more! Win a $1,000 Visa gift card & a year supply of Dreamfields pasta! ENTER SWEEPSTAKES HERE – Dreamfields Sweepstakes page. ENTRY LIMIT – Limit: one (1) entry per person per day. ELIGIBILITY – The Sweepstakes is open only to contestants who sign up at the online Sweepstakes page and who are 18 years of age or older and of the age of majority in the jurisdiction where they reside as of the date of entry. The Sweepstakes is only open to legal residents of the United States, living in one of the 50 United States or the District of Columbia. SWEEPSTAKES ENTRY PERIOD – The Sweepstakes period begins on January 14, 2018 12:01 A.M. (EST), and continues through February 3, 2018 at 11:59pm EST. 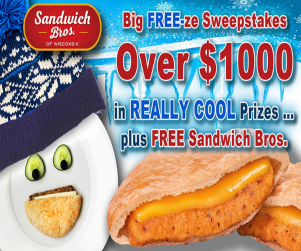 Sandwich Bros. Big FREEze Sweepstakes – Win a $1,000 Visa gift card & more! Win a $1,000 Visa Gift card & more! ENTER SWEEPSTAKES HERE – Sandwich Bros. Sweepstakes page. ENTRY LIMIT – You may enter once per email address per household per day. ELIGIBILITY – This Campaign is open only to those who are 18 years or older as of the date of entry. SWEEPSTAKES ENTRY PERIOD – Entries will be accepted online starting on February 27, 2017 at 12:00am CST and ending April 3, 2017 at 11:59pm CST. All online entries must be received by April 3, 2017 at 11:59pm CST. PRIZES – The Winner of the Campaign will receive a $1,000 Visa Gift Card, a year-supply of Sandwich Bros. (52 Free Product coupons) and a Sandwich Bros. Prize pack with a hat, bag, T-shirt, mug and nail art. Approximate retail value $1,360. Ball Park® Buns Team Hot Dog vs. Team Burger Sweepstakes – Win tickets to a professional football game & more! Win two tickets to a 2017 – 2018 professional football game & $1,000 Visa gift card! ENTER SWEEPSTAKES HERE – Ball Park Sweepstakes page. ENTRY LIMIT – Limit one (1) Entry per person per e-mail address for the duration of the Sweepstakes Period. ELIGIBILITY – Sweepstakes is open to legal residents of the fifty (50) United States and the District of Columbia, 18 years of age or older as of date of entry. 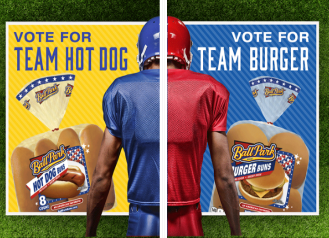 SWEEPSTAKES ENTRY PERIOD – The Ball Park® Buns Team Hot Dog vs. Team Burger Sweepstakes starts on January 4, 2017 at 12:00 a.m. Eastern Time (“ET”) and ends on January 31, 2017 at 11:59 p.m. ET. PRIZES – GRAND PRIZE (1): Two (2) tickets to a 2017-2018 professional football game of winner’s choice played within the continental United States (any/all international games will not be available for selection) and one (1) $1,000 Visa gift card that may be used to assist with transportation and accommodation costs to attend the selected game. The Approximate Retail Value (“ARV”) of the Grand Prize package: $1,400 Sponsor and Administrator will try to accommodate winner’s choice of team tickets and game date, however the exact tickets, game, location, date and time of game will be determined by Sponsor in its sole discretion. FIRST PRIZES (10): A Team Hot Dog vs. Team Burger Swag Pack that includes Ball Park® Buns for a year, awarded in the form of 52 coupons, each redeemable for a package of Ball Park® Buns up to $4.00 in value, a t-shirt and a computer thumb drive. The ARV of each First Prize: $248.00. 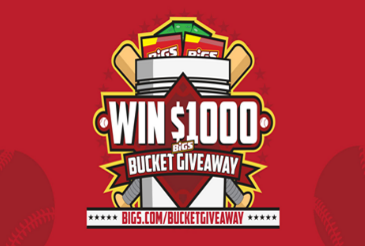 “BIGS® Bucket Giveaway” Sweepstakes – Win $1,000 Visa gift card! Win a $1,000 Visa gift card & more (4 winners)! ENTER SWEEPSTAKES HERE – BIGS Sweepstakes page. ENTRY LIMIT – Limit one (1) entry per person per Entry Period, throughout the Sweepstakes Period. Limit four (4) total entries per person. ELIGIBILITY – The “BIGS® Bucket Giveaway” Sweepstakes is open only to legal residents of the fifty (50) United States (including the District of Columbia), who have reached the age of majority in their state of residence at the time of entry. SWEEPSTAKES ENTRY PERIOD – The Sweepstakes begins at 12:00:01 a.m. Eastern Time (“ET”) on April 1, 2016 and ends at 11:59:59 p.m. ET on July 9, 2016. PRIZES – There will be four (4) Grand Prizes (“Grand Prize” or “Prize”) and ninety-six (96) First Prizes (“First Prize” or “Prize”) awarded. Each Grand Prize Winner (“Grand Prize Winner” or “Winner”), upon the Administrator’s confirmation of eligibility, will receive one (1) $1,000 prepaid VISA gift card and one (1) 6-Gallon BIGS Buckets w/ fifteen (15) Bags of seeds. The Approximate Retail Value (“ARV”) of each Grand Prize is: $1,045. Each First Prize winner will receive one (1) 6-Gallon BIGS Buckets w/ 15 Bags of seeds (ARV – $45). Total Prize Pool – $8,500. 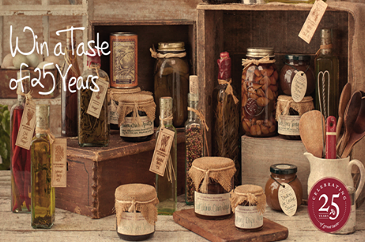 Stonewall Kitchen Taste of 25 Years Sweepstakes – Win a $1,000 Visa gift card & more! Win a $500 Stonewall Kitchen gift card, a $1,000 Visa gift card & more! ENTER SWEEPSTAKES HERE – Stonewall Kitchen Sweepstakes page. ENTRY LIMIT – Limit of one entry per person, per email address. ELIGIBILITY – The Sweepstakes is open to legal residents of the United States and District of Columbia, who are eighteen (18) years of age or older at the time of entry or age of majority in their state of residence (which is eighteen (18) in most states but is nineteen (19) in Alabama and Nebraska and twenty-one (21) in Mississippi). SWEEPSTAKES ENTRY PERIOD – The “Stonewall Kitchen Taste of 25 Years Sweepstakes” begins Monday, May 2, 2016 at 12:00:01 AM Eastern Daylight Time (“ET”) and ends Friday, July 1, 2016 at 11:59:59 PM. ET. Daily Giveaway begins Monday, May 2, 2016 at 12:00:01 AM Eastern Daylight Time (“ET”) and ends Friday, June 3, 2016 at 11:59:59 PM. PRIZES – GRAND PRIZE: The winner will receive one (1) $500 Stonewall Kitchen Gift Card for shopping spree at the store or online, $140 gift card for cooking class at Stonewall Kitchen’s Cooking School, (1) VISA gift card for travel stipend up to $1000, and (1) Company Classics gift basket (Retail value: $200). Total Stonewall Kitchen, LLC Prize approximate retail value (“ARV”) is $1,840. Total Grand Prize approximate retail value (“ARV”) is $1,840. DAILY GIVEAWAY (Entry Period: May 2, 2016 through June 3, 2016) The winner will receive one (1) Stonewall Kitchen product from the Company Classics Collection. Total Daily Giveaway Prize approximate retail value (“ARV”) is up to $10 per giveaway prize. Lindsay® 100 Bite-Size Moments Contest – Win a $1,000 Visa gift card & more! Win a $1,000 Visa gift card and a illustrated print of your bite-sized moment (5 winners)! ENTER SWEEPSTAKES HERE – Lindsay Olives Sweepstakes page. ENTRY LIMIT – There is a limit of one (1) eligible entry per person, per day during the Promotion Period. ELIGIBILITY – The Promotion is open only to legal residents of the fifty (50) United States and the District of Columbia who are at least eighteen (18) years old at the time of entry. Void in Guam, Puerto Rico, the U.S. Virgin Islands, and other U.S. territories and possessions, overseas military installations and where prohibited by law. SWEEPSTAKES ENTRY PERIOD – The Promotion begins on April 19, 2016 at 11:00 AM Pacific Time (“PT”) and ends on May 17, 2016 at 10:59:59 AM PT. PRIZES – Grand Prizes: Each of the five (5) Grand Prize winners will receive a $1,000 VISA® Gift Card and a complimentary archival-quality print of their illustrated “Bite-size moment” Approximate Retail Value (“ARV”) $1,000 each. There are a total of five (5) prizes available with the total of all prizes of $5,000. 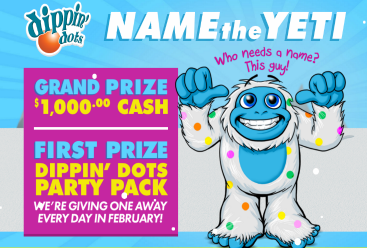 Dippin’ Dots Name the Yeti Sweepstakes – Win a $1,000 Visa gift card! ENTER SWEEPSTAKES HERE – Dippin’ Dots Sweepstakes page. ENTRY LIMIT – Limit of one entry per internet protocol address per day during the Promotion Period. ELIGIBILITY – The DIPPIN’ DOTS NAME THE YETI Promotion is open only to legal residents of the fifty (50) United States (including District of Columbia) who are at least thirteen (13) years old at the time of entry. SWEEPSTAKES ENTRY PERIOD – The Promotion begins on or about February 1, 2016 at 12:00 P.M. Central Time (“CT”) and ends on February 29, 2016 at 12:00 P.M. CT.
PRIZES – Grand Prize ONE (1) GRAND PRIZE is available and Grand Prize Winner will receive the following: one (1) Visa® Gift Card in the amount of $1,000 (one thousand dollars). Total Grand Prize Approximate Retail Value (“AVR”): $1,000. TWENTY NINE (29) DAILY PRIZES are available. Each Daily Prize Winner will receive the following: one certificate good for one (1) Dippin’ Dots home delivery shipments of one (1) 30-serving kit (one bulk bag of Dippin’ Dots), free FedEx ground shipping, said certificate expiring March 31, 2017. 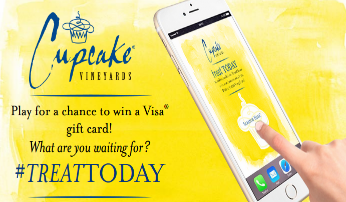 Cupcake® Vineyards Treat Today® Sweepstakes – Win a $1,000 Visa gift card! Win a $1,000 Visa gift card (3 winners)! ENTER SWEEPSTAKES HERE – Cupcake Vineyards Facebook page. ENTRY LIMIT – Limit one (1) game play per person per day during the Promotion Period, regardless of the number of email addresses or accounts a person may have. ELIGIBILITY – The Sweepstakes is open only to legal residents of the fifty (50) United States and the District of Columbia who are 21 years of age or older at the time of game play. SWEEPSTAKES ENTRY PERIOD – The game play period begins at 10:00:00 a.m. Eastern Time (“ET”) on 10/01/2015 and ends at 11:59:59 p.m. ET on 12/31/2015. PRIZES – Instant Win Prizes/Odds of Winning: Grand Prizes (3 – one per Play Period): A $1,000 Visa® Gift Card. Odds 1 in 3,334. First Prizes (6 – two per Play Period): A $500 Visa® Gift Card. Odds 1 in 1,667. Second Prizes (51 – 17 per Play Period): A $100 Visa® Gift Card. Odds 1 in 197. Schwinn ® Ride of a Lifetime Giveaway – Win 2 bikes & a $1,000 Visa gift card! 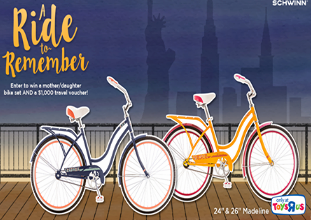 Win 2 Ladies Schwinn Madeline bicycles and a $1,000 Visa gift card! ENTER SWEEPSTAKES HERE – Schwinn Sweepstakes page. ENTRY LIMIT – Only one entry will be counted per person. ELIGIBILITY – Schwinn ® Ride of a Lifetime Giveaway (the “Contest”) is open only to legal residents of the fifty United States and District of Columbia, who are at least thirteen years of age or older at the time of entry and are members of Facebook. SWEEPSTAKES ENTRY PERIOD – This contest begins at 8:00 a.m. (CST) on November 8, 2015, and continues until 12:00 p.m. (CST) on November 28, 2015. PRIZES – One (1) grand prize winner will be awarded in the Sweepstakes. a) Two (2) Ladies Schwinn Madeline bicycles; one (1) Ladies 24” bicycle and one (1) Ladies’ 26” bicycle, will be given away. b) One (1) VISA gift card valued at $1,000 will also be given to the grand prize winner to be used as the winner deems fit. The approximate retail value of the Grand Prize is $1,300.